Till Christmas! And today, I gave myself an early Christmas present …a day off. No driving, no sliding, no conferencing, no filing. As it turned out, schools in West MI closed today, 1″ of ice on the roads tends to slow everything – and everyone – down. Kids are gleeful, as winter break comes early 🙂 How I remember those days! So .. I spent the morning baking and cooking and putting together a few care packages. One for my Father-in-Law, whom we’ll see tomorrow, a few more for friends, and the rest .. the rest for my crew here at home. Want to make some? Want to dazzle your cast & crew, too? Spread several sheets of waxed paper on your kitchen counter (not on a wood table, as these will be hot at first). Melt chocolate according to directions on package; ~ 1 min on high, stir, melt another 15 seconds or so then pour in peanuts and stir to coat. Drop tablespoons of the chocolate-peanutty goodness onto the paper and allow to cool — about 1 1/2 hours. Break into smaller pieces (or not) and cover — these can be frozen, they travel great (if they break apart, who cares?) and are a hit everywhere I take them! 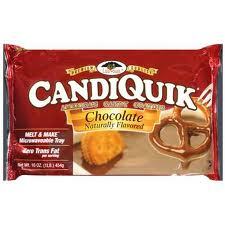 I store them in zip-lock bags in the freezer, hidden away from Hubbs. Super easy, super quick, and super goood! I hope Hubbs doesn’t read your blog or he will be ripping apart you freezer in January looking for them. Yum! You’re making me hungry. I we weren’t taking off on a road trip to New York I would make a batch of these tomorrow. They’re pretty wonderful – and good at any time of year. I’ve made them for baby showers, birthdays, well-wishes visits, and, of course, Christmas! I’m drooling. They have to be my favorite. OMG, those look like DELICIOUSNESS! What a perfect recipe – quick and easy with a lot of appeal! Yum. yes and yes and yes! Those peanut clusters look totally deelish! I splurged on some inexpensive jewelry for myself this holiday. Because I can’t eat any dairy products, holiday food is not really a splurge for me. (And we don’t eat beef or pork any longer). Just think of all of your holiday favorites and I bet there is some sort of dairy in it: cheese, milk product, etc. Have a very Merry Christmas!! Oops! I “saved” this post to read later…and here it is THREE days later! Glad you took the day off. 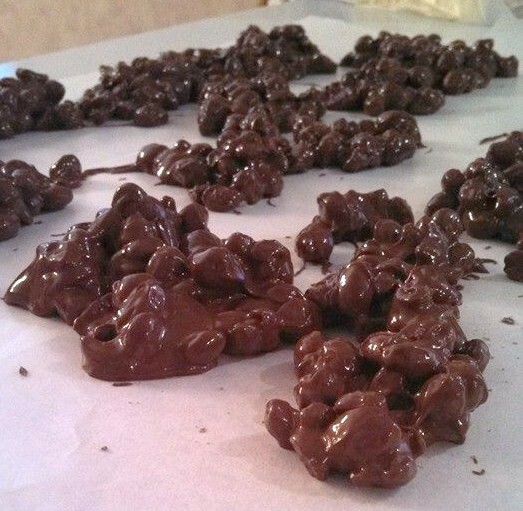 Those chocolate peanut clusters look delish! I’d probably have a hard time parting with any of those! Those look simple and delicious. YUM! We can’t let Christmas go by without baking some sugar cookie cutouts and frosting them in pretty colors. And they are – simple and delicious!